One week since Hurricane Harvey wreaked havoc on Houston and the surrounding areas, Fr. Kurtz sent me this UPDATE on Queen of Angels parish in Dickinson. Please continue to pray for those whose lives may not resemble anything normal for a long time. Your generous contributions to the relief effort may be made HERE. The devastation from Hurricane Harvey continues in the Houston area as they brace for yet more torrential rain. 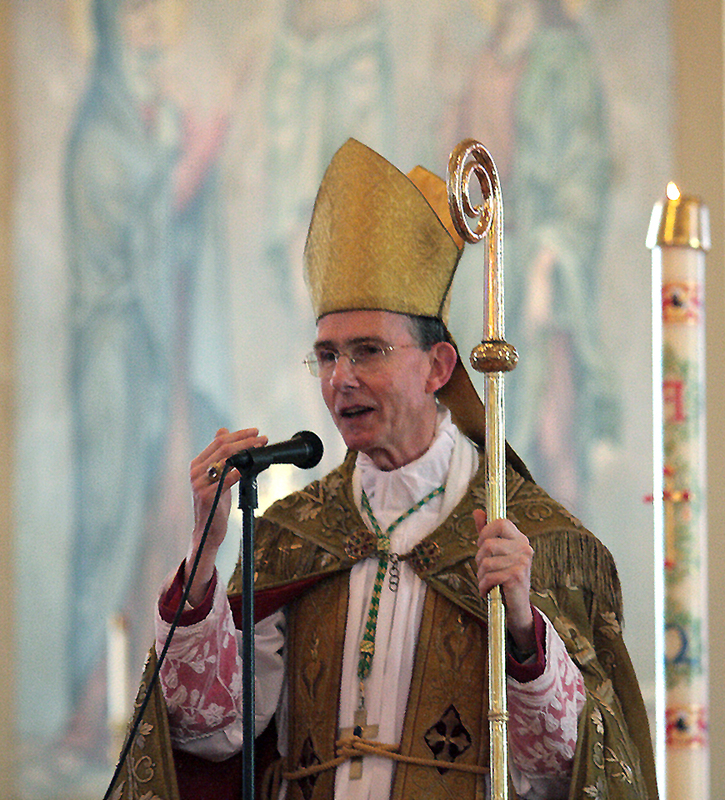 Our good priest-friend Father Kurtz is Pastor and Prior of Queen of Angels parish in Dickinson, TX, a suburb of Houston. Two parishioners have lost their lives in the flooding, and many have lost their homes. The church buildings have sustained some damage to the bookstore and offices (so far), and the priests and brothers in residence at the Priory have now been evacuated. Your financial assistance is greatly needed. For information on how to donate as well as information and video updates, please CLICK HERE. And of course your prayers are most appreciated! All morning long and at every hour. Sight of delight for the young and the old. I recently left FaceBook after many, many years. Perhaps I'll find time to blog again. Well, I'll blog today, at least. I read the following this morning. It is the essence of how one may endure well the life of disability (physical disability in my case), if focused on God. Of course it applies to everyone in every condition. But it occurs to me that it may be easier for me as I have little choice in the matter; as far as my physical capabilities go, I have been given limitations. But I wonder if in eternity I will understand how truly blessed I have been in this sense. Choice carries with it a great responsibility for choosing a virtuous path. "An existence spent in doing the Divine will is life in the fullest, most magnificent sense, for the spiritual faculties, directed by and towards the Supreme Good, act according to their true nature. Such a human life is independent of all exterior circumstances of place, change or variety, it is the only life immune from monotony or failure, filled with the peace of God, crowned with success that is eternal." My Yoke is Sweet, by Rev. John Kearney, C.S.Sp. 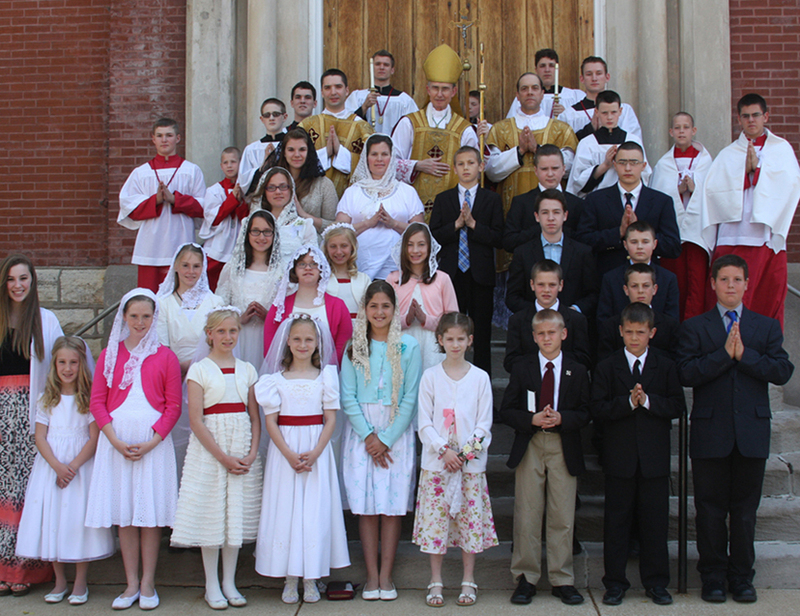 God bless our newly Confirmed in the Faith. God bless our pastor, shepherds, and His Excellency, Bishop Tissier de Mallarais. Love, jealousy, envy, spite... murder!! All ingredients that might make for one of Fr. Haynos' Sunday sermons! But no, nothing of the kind. 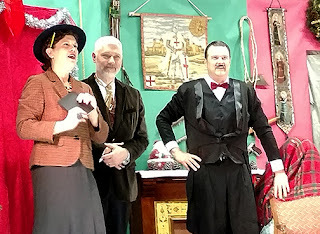 This was instead the stuff of the 15th Annual Laetare Dinner Theatre and this year's production of "The Game's Afoot! ", a Murder Mystery/Comedy in Two Acts by Kenneth Ludwig. 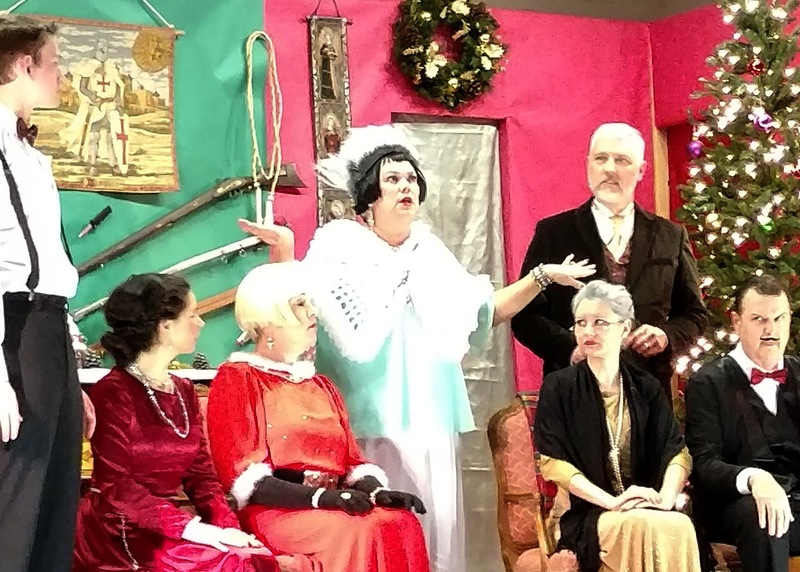 Mrs. Hilary Flanery, Director/Actress of the Queen's Players of St. Mary's Assumption, assisted by Mrs. Vicki Hinzpeter, once again led her fearless troupe of actors in delighting two sold-out audiences with their production on another Laetare Sunday weekend. 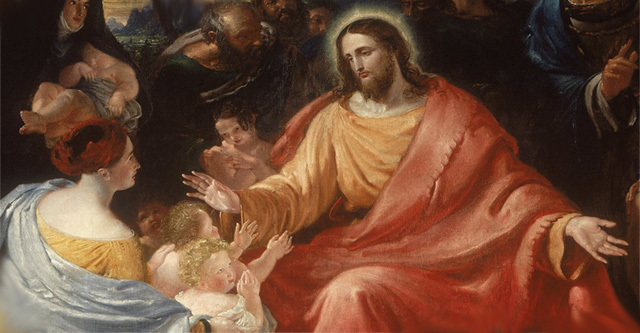 And how fitting for this weekend it was, as Holy Mother Church gives us this brief break in the midst of the long penitential season of Lent to stop and rejoice, remembering that soon we will be celebrating the Resurrection of Our Lord Jesus Christ on Easter Sunday, just three weeks hence. It is with this great Hope that we are emboldened to persevere in our sacrifices and reparations until then. 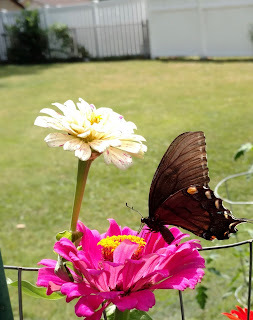 But this Laetare weekend our focus is rejoicing in the Truth, and relaxing for this time in some merriment and mirth shared together among the faithful, all of which is rendered effortless by the entertainment of the Queens Players. The play opens with the last scene of a production of a Sherlock Holmes play at the Palace Theatre in New York, circa 1936. Mr. Matt Grahek leads the cast as the dashing William Gillette, the star of the play, who is shot during the final scene, but survives this attempt on his (.... or was it his?) life. 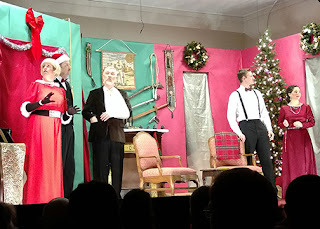 The story then moves to Mr. Gillette's mansion in Connecticut where he and his elderly mother, played most convincingly by the far-more-youthful Miss Emily Crouse, are entertaining their actor friends on Christmas Eve. As guests arrive at the party, it is not long before the suspicion arises as to who might be responsible for the attempt on Gillette's life, and others' lives too, it soon becomes apparent. But it is with the arrival of Daria Chase (Mrs. Hilary Flanery) gossip columnist and socialite extraordinaire, with a hairdo that is a perfect combination of Cruella DeVil and Don King, that the tension begins to heat up. The flames of suspicion are fanned by Daria's gossipy rendition of what happened at the Killington ski resort just one year prior when actress Aggie Wheeler's (Miss Bernadette Kohler) millionaire husband suddenly dies in an accident on the slopes, money-hungry actor Simon Bright (Mr. Kyle Matteson), despite already having a girlfriend, comes to the quick and emotional rescue of seemingly-sweet Aggie and marries her, and it is further revealed that a doorman at the theatre has had his throat slit. Everyone present becomes at once a suspect! Daria soon turns to her experience as a medium to call up from the dead a witness to the murders. Mrs. Flanery is hilarious as she attempts the summons of "Lorentia!!" and the guests all get nervous over what is taking place as well as being potentially blamed for the murder they did (or did not) commit. Daria herself is then mysteriously stabbed in the back and her corpse hidden (after Gillette's elderly mother confesses quite matter-of-factly to the crime) in the retractable bar. Felix and Madge Giesel (played by the ever-dry Mr. Steve Crouse and Mrs. Donna Kallal who could win a screaming contest anywhere!) two more actors at the party, add their own measures of anxiety, suspicion, and jealousy to the ring, when in walks Inspector Goring (Miss Jane Binsfeld), a younger Miss Marple if there ever was one, complete with her British accent, to attempt to solve the crimes once and for all. Gillette, a real-life Sherlock Holmes wannabe, is not about to see his mother convicted, but is also intent on finding the murderer(s). And thus the tale ensues! 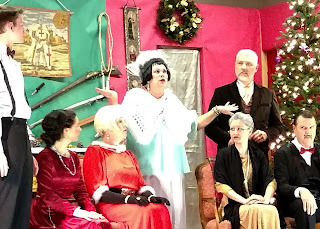 The production is definitely a murder mystery turned comedy as the cast was brilliant in their delivery of lines, facial expressions and gestures, and especially as regards dropping St. Mary's parishioners' names into their lines. The left-right-left-right shift of faces and eyes in perfect sync with each other and the sound track was laugh-out-loud funny each time nurse Karen Hayes' name was mentioned. If audience reaction was any indication, the show was a magnificent success. The catered pre-performance dinner and drinks were delicious; the opportunity for friends to relax and enjoy one another's company and the evening's entertainment was sublime. All proceeds of the annual production go to Queen of the Holy Rosary Academy, where children pre-K through 8th grade are taught in a traditional Catholic setting, assist at Mass several times a week, and learn their faith, in a concerted effort to fulfill the Academy's mission to raise up children who will become faithful Catholic leaders by way of vocations to the priesthood and religious life, or as single or married Catholic men and women. And so, a hearty thanks and God's blessings on all the cast and behind-the-scenes crew members of the Queens Players for their many hours of hard work on this year's production of "The Game's Afoot", and for entertaining well our beloved priests, faithful, friends, and family. We hope to have the privilege of enjoying many more Laetare Dinner Theatre productions in the years to come!